Welcome to our Stamp of the Month Blog Hop! We will be featuring July's SOTM, which is a funky cute font called Circus Alphabet, a set of 69 stamps. If you have come here from MICHELLE'S BLOG, you are on the right path! The blog hop is a great big circle, so you can start here and work your way all around. If you get lost along the way, you’ll find the complete list of participating consultants here. This month we have over 40 Close To My Heart Consultants sharing their creations using this month's SOTM and other great CTMH products on their blogs. Hopping is simple to do - just click on the link at the end of the post on each blog to move to the next one! Here we go! This month I designed a 10 card workshop using the July SOTM for all of the sentiments and focused on using only White Daisy Cardstock (along with 5 rainbow colored markers). I made good use of our versatile Art Philosophy and Artiste Cricut cartridges, plus I used a few of our new awesomely crisp embossing folders! 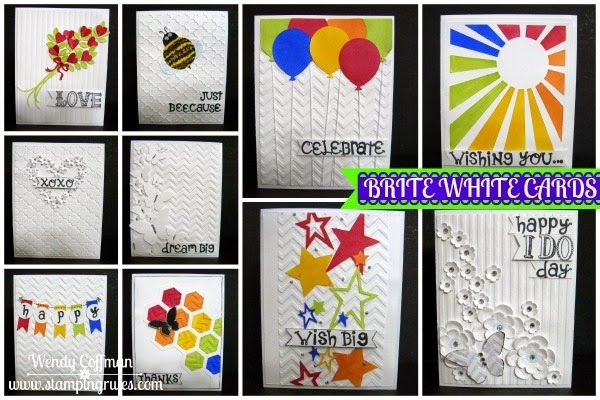 All ten cards came from just 4 sheets of White Daisy Cardstock (plus card bases) making for clean and simple cards with bright punches of color! I love the dramatic impact of white on white cards too - so crisp and pretty. Consultant kit info for this project will be posted tomorrow, as I'm in the middle of revamping that page completely to correspond with the new policies announced at convention. Now "Hop" on over to SARITA'S BLOG to see her work! Be sure to visit all the Consultants' Blogs to get lots more fun ideas! Remember, the July SOTM is only available until until the end of July. Contact your CTMH Consultant (or click here) to see how you can get this stamp set for just $5! Holy Cow these are cute! I feel a lift coming on! Great Cards! I love bright summer colors on white. These are all fantastic! Nice, bright, summery! I have trouble creating cards with lots of white space. You have given me great inspiration. Thanks! love all of the cards! the white is so COOL! But you have me curious... what do need to make your blog in compliance with the new policies? I watched the video today and now you have me really curious! In the new policies we will be allowed to sell out templates and kit instructions without an OBA order, so I'm busily working in revamping my consultant kit page! My kit instructions take me a long time to produce, complete with cutting guides and a teaching guide, so that was good news for me, Lalia! I love the color pop on the White Daisy cardstock. Great cards! Love the white-on-white, the embossed white, and the bright colors on white. Nice, clean look.